China Social Club are welcoming in spring with a bloom. 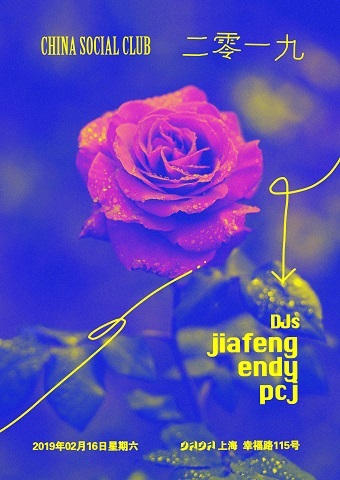 DJs Jiafeng and Endy join PCJ for a mix of new beat, disco not disco, breaks, house and techno. Jiafeng is a unique talent on China’s music landscape, riffing on internet culture in a way that is purely his own. Endy Chen kicks off your night with an exploration of recent digs and longtime favourites. PCJ is a Shanghai based Australian DJ and vinyl selector. He’s a co-founder of China Social Club and his sets travel through many genres including disco, house, Italo and techno.